Is there an age when we think our bodies are no fun? We are falling apart? When we look at the youth and miss that feeling of being bouncy ??? There is a woman on my Instagram who is a sensation in our country for the things she has done not at the peak of her youth but at a time when most of us think – we need to settle down! If this has piqued your interest – take a look a the 100SareePact to read the revolution she has created! And if you were lazy to click on that link – then check out this TED Talk she did with Shahrukh Khan. I am convinced she has created history. She does yoga, she jumps ropes, she squats and basically challenges the human inside her everyday at every level! So you know…She does not settle down. I don’t want to reduce her to a celebrity – I want to call her a Changemaker ! There are so many interviews on Anju all over Social Media but the one you would love reading this interview on Anju is done by my friend Sandhya Balasubramaniam. I will leave you with an itch to get up and get going! I have no doubt she is constantly inspiring many more women like me! 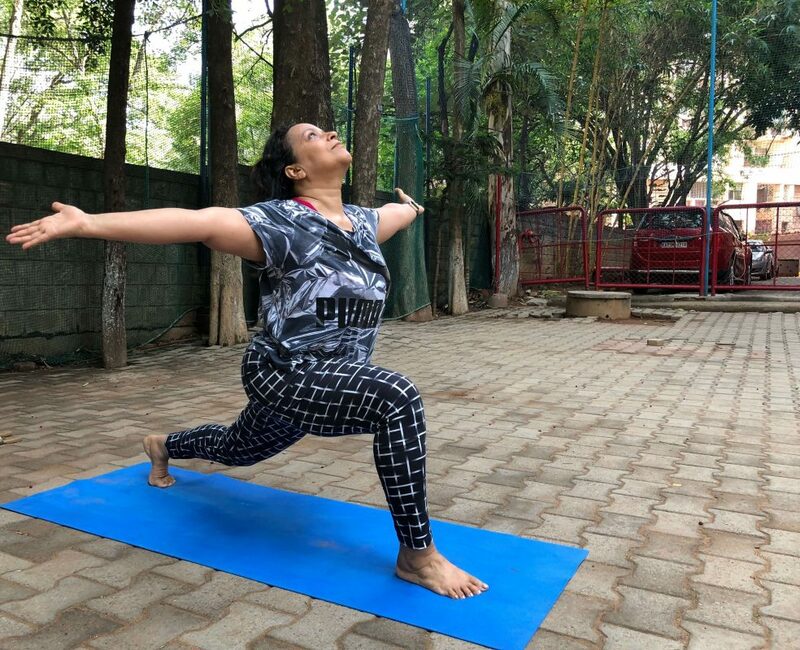 So I wrote to Anju that I wanted to have her over on my blog WellthyFit – on all about her fitness! How do you sustain the motivation and discipline on everyday basis? I’ve said this in several interviews, it requires a switch in your brain to turn on to make yourself, your health and fitness, mental and physical, a priority. Once that happens, once you understand that you will always be the most important project you work on, and that you will always be work in progress, the motivation comes automatically. Every session of exercise that I finish, the endorphins kick in, I wouldn’t trade that in for anything easily. Looking back at your 30s, how would you have done things differently to keep yourself fit and healthy? I think our 30’s, especially for women, are the years we ignore ourselves the most. That invincibility of the 20’s is in the past, but the breathlessness of the thirties is upon us in full throttle. Career, family, establishing oneself, discovering one’s strengths, acknowledging one’s weakness, all this with the daily grind of reaching for success, however we may define it, makes the thirties a mighty busy time. It was for me too. I had both my children in my thirties, 32 and 36, and I think I spent almost all of those years in severe lack of sleep, worrying – about everything possible, and rebuilding a career after a sabbatical. Whats’s your fitness routine like? – 10,000 steps every single day unless I am not well, then I make sure I rest. I exercise everyday unless I am sick. If you eat every day, you breathe everyday, you exercise everyday. Simple. I fit in three days of strength training…not super heavy stuff , a lot of bodyweight exercises, and functional training. On other days, I do yoga, I swim, I’ll take a Zumba class,or a spin class anything that catches my fancy. The past year I have done most of the exercising at home, or in my building with my coaches, though I will be moving back to a CrossFit box #highspiritscrossfit in June. What about your food and nutrition? I’m vegetarian. I have help in the house, but I like cooking myself once the prep is done. When we go out I make smart choices most times. Never been a huge drinker, never needed it to be happy. Again, I like the romance of a drink in a beautiful glass and conversations, it really could just be water in that glass:-) . Though I enjoy my single malt whiskey. Never liked cocktails. As I have grown older, I have understood better that food is the key to health and fitness and well being. Everyday I learn, every day I experiment. Food is simple dal, roti, sabzi, salad, chawal, lassi in the house. With a peppering of south Indian dishes ( we are bangalored ! ), and the usual Italian cuisine ( white food) that the kids like. But I can sit on the dining table, have a couple of bites of pizza and move to my meal so easily now. It is not a sacrifice, it is a choice. And I have made my choices and enjoy fresh, nutritious food more than processed food. You do Yoga and Strength training – educate us on how they are building you stronger in their own ways. If you had to recommend between the two – which one would that be? Strength training is something I advise EVERY woman to do. First we need it, to build muscle mass but I also think it is empowering. When you build strength, it is not just the body but also the mind that gets stronger. It’s interesting to see the change in attitude of a woman who begins strength training. Most approach it with trepidition, some are downright scared, but once they begin, I know very few who don’t end up loving it. I find strength training empowering on many levels. Yoga is a holistic approach to well being. It works on the gross and also the subtle systems – body, mind, all this through breath. Yoga really is the best therapy for us all. Flexibility, agility, strength in mind and body, yoga works on them all. As I get older, I’d like to do more yoga, it agrees with my soul. Beyond the 40s, for both men and women, fitness and health becomes much more than the physicality of looking good. FEELING good outshines the looking good anyway. Also, one is more accepting of ones faults, physical or otherwise and more willing to work on them. “…..begin small. If you don’t do anything at all, begin to walk. Build up on speed and distance as you go. Swim, take a class in a gym. Don’t like gyms ? Open the internet and there are a zillion ways to exercise at home if you don’t have time to step out. Be sensible about what you do if it is unsupervised. Put on music, dance ! Get a skipping rope and skip. Do squats, lunges, push ups. Work with stretch bands…I mean there is a workout to suit EVERY single fancy. But it is ONLY you who decides to get up and do it, and make the choice on what to eat. Food is fuel, energy, life. Exercise is the outcome of all that we eat and have become. You fix your food, the exercise comes after that. NOT the other way. I thank Anju for pushing and inspiring us to Always Always make a better version of ourselves. Key Takeaway from this article – NEVER SETTLE!